On Saturday 22 September, 80 members of the West Midlands Area gathered at the World of Wedgwood, in Barlaston, to celebrate the Arts Society's Golden Jubilee ..... by taking tea. The afternoon event was preceded by a Young Arts event at which the design team at Wedgwood judged some very special plate designs created by children from schools in the West Midlands. To celebrate our Society's anniversary, children aged 8 –10 in schools in the West Midlands Area were asked to design a plate based on “My Birthday Tea Party” the the inspired idea of Edwina McConville, the West Midlands Area Young Arts Coordinator. The Wolverhampton chairman, Glenys King, approached 18 schools and enthused them about the competition. Winners were selected from each school and in June the Mayor of Wolverhampton, Councillor Phil Page, made a presentation at Bilston School to the overall winner and runners-up. The winner, Nikodem Urbanczyk from Poland, could not speak English until two years ago. They have given the local winner’s school the prize of a year’s group subscription to the National Trust. 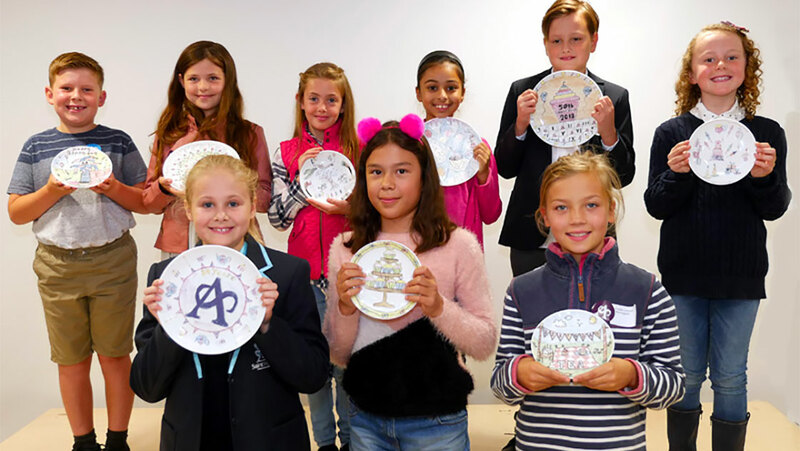 All the finalists in the competition had their designs made into plates at the Wedgwood factory and received their prizes, presented to the children by National Young Arts Chairman Denise Topolski on Saturday morning on 22 September. The tea party theme was chosen to coincide with a Golden Jubilee tea party which members enjoyed during the afternoon following a lecture given by Gaye Blake Roberts, the Director of the Wedgwood Museum, on ‘The Art of Taking Tea’. Edwina McConville commented “I was thrilled that so many societies decided to take part and were very enthusiastic in approaching schools. The teachers too are to be congratulated in helping to enthuse the children in the competition. There was a very high standard of entries which made judging the winners a tricky but enjoyable task”.